Find us on Facebook at facebook.com/stnorbert. Social sharing is everywhere, within and beyond St. Norbert College. Browse our collection of SNC-affiliated accounts and, for more information, contact our social media manager, Nina Nolan Rouse. You can view videos from St. Norbert College, including episodes of “Conversations From St. Norbert College” and services of Common Prayer, on YouTube. 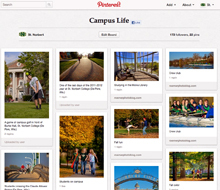 Enjoy tidbits and imagery by following our pinboards on Pinterest. A picture is worth a thousand words! See St. Norbert College photos on Flickr and Instagram. Guidelines for St. Norbert departments and units involved in social media. The college policy for students, faculty and staff conducting social media activities on behalf of the college. The college policy for comments posted to college-owned social media channels. A pool of CC-licensed content available for free and legal use. A database of information on copyright issues, with examples of fair use and policies. 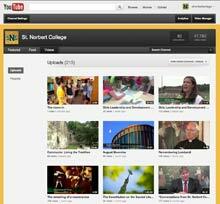 A listserv that unites St. Norbert College campus departments and units that are engaged in social media. Social media practitioners are invited to become members in order to share social media tips/tricks, trends and experiences. An online social media magazine that helps businesses discover how to best use social media, blogs and podcasts to connect with customers, drive traffic, generate more brand awareness and increase sales.